The Short Version: If you want to eliminate bad dates from your social calendar, you can hire a professional matchmaking firm to hand-select compatible dates and save you time in the search for a relationship. Matchmaker Shannon Tebb founded Shanny in the City to help Toronto singles make a love connection in a streamlined dating process. She pays close attention to each client’s dating preferences, values, and style so she can make a smart match with a high chance of success. Additionally, Shannon backs singles as a dating coach and event organizer, empowering singles to date on their own time. She’ll even come along as a wingwoman to boost your confidence in a social setting. With such personalized services, Shannon Tebb provides the emotional support and professional assistance that spurs singles into fulfilling relationships. Growing up with a single mom meant Shannon Tebb became familiar with how dating works from a young age. As she watched her mom navigate the dating scene, she felt fascinated by the whole mysterious process. While her classmates spent their time thinking about movies and Barbie dolls, she found herself wondering about attraction and relationships. Matchmaker Shannon Tebb founded Shanny in the City to help singles become 100% ready to date. She felt drawn to the topic of relationships throughout her life. She attended Carlton University where she studied Sociology and Like Skills Coaching at George Brown College to learn more about how people interact and became the go-to person for dating advice for all her friends. Then, when Shannon saw the movie “Hitch” in 2005, she knew she’d found her calling in life. She started her own dating consulting business in 2010, and today Shanny in the City is ranked among Toronto’s top matchmaking firms with a variety of hands-on services to support singles looking for love. From writing dating profiles to arranging dates, Shannon takes proactive steps to ensure her clients maximize their dating potential and see results in a short period of time. Commitment-oriented men and women can register online to learn more about the matchmaking process and see if Shannon’s coaching style, singles events, and networking opportunities are a good fit. 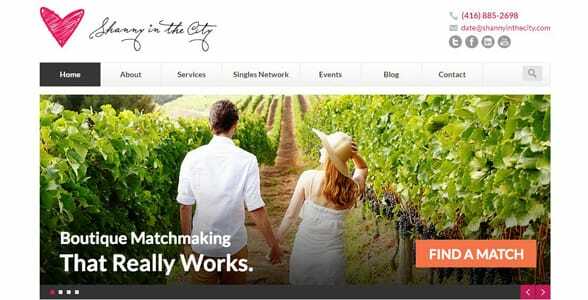 Shanny in the City’s matchmaking package ushers singles through a personalized and effortless dating experience. In an initial consultation, Shannon discusses the new member’s expectations and goals before agreeing to take that person on as a client. She screens all date prospects so you don’t have to waste time swiping online or scanning a bar for a good first date. Working mostly through referrals, Shannon has steadily grown her client base of singles ranging in age from 25 to 55. Singles come to her boutique matchmaking firm because they want to invest in long-term love. Over the past decade, she has honed the process of making a match and getting her clients feeling confident when going out on an arranged date. Shannon approaches matchmaking with an inclusive and positive attitude. Her studies in anthropology inform her view on relationships and family dynamics, giving her a broad cultural awareness so she can connect with clients of all backgrounds. As part of her dating consulting package, Shannon engages with singles in 60-minute sessions over Skype or in person to develop personalized dating strategies that will work. Skyping with clients from around the world, the dating coach shares her expertise in flirting, interpreting signals, rekindling romance, making the first move, and other dating skills. She can also help fine-tune a client’s online dating profile so it best represents the single person’s good qualities. Singles of all experience levels receive warm and clear guidance from Shanny in the City. The services change to suit the individual’s needs. In one-on-one dating consultations, Shannon focuses on improving body language, conversational style, and confidence levels. During more in-depth life skills coaching, she works on goal-setting, personal style, relationship skills, and active listening and, ultimately, gives clients the tools to become more attractive and accomplished in all aspects of life. Shannon aims to make her clients feel comfortable on a date. During mock dates, she offers clients a way to practice their dating etiquette and receive specific feedback on what they can improve. She gives her clients detailed notes about their dating blind spots so they have a resource to study up on their own time. From online dating management to wardrobe consultations, Shannon offers valuable advice to single men and women. Oftentimes, Shannon points out details — like to order share plates and sit at the bar instead of a table to avoid the interview experience — most daters might not think about, but should consider when going out with someone. The action-oriented dating coach wants her clients to know what to do on a date so it lessens their nerves on the big day and they enjoy more successful dates as a result. Canadians eager to date on their own can attend Shanny in the City’s singles events held throughout the year. These dynamic get-togethers invite singles to enjoy a happy hour at a local venue and mingle in a casual dating atmosphere. 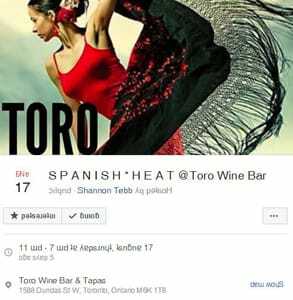 A recent event organized by Shanny in the City included complimentary Spanish tapas, summer sangria, and a local DJ. You don’t have to be single to have a good time at these social gatherings. It’s all about networking with people and finding date opportunities in every new connection. Maybe the person you meet is married, but he or she has a single friend who’s perfect for you. Shannon said it’s important to go in with an open mind and a friendly attitude to make the most of the event. After decades of experience and education, Shannon’s childhood curiosity about dating has developed into a full-fledged career. Based in Toronto, she operates a professional matchmaking firm helping hundreds of single men and women find love. The savvy dating expert excels at explaining to her clients how to act to attract their dream dates. As a matchmaker, dating coach, and wingwoman, Shannon offers Toronto singles a variety of ways to get their love lives into shape. Whether you’re looking for a lifelong companion or just some advice on what to say on a date, Shanny in the City can point you in the right direction.